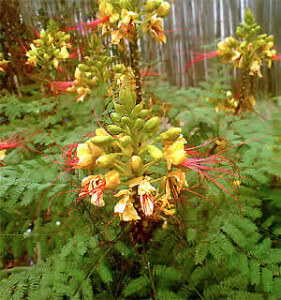 The Red Bird of Paradise (Caesalpinia pulcherrima) has long been a favorite summer blooming plant in Tucson, Arizona. It celebrates the warm season with a dazzling display of orange-red flowers. 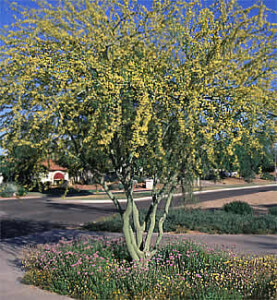 This shrub grows fast to 8 feet tall with an equal or greater spread. 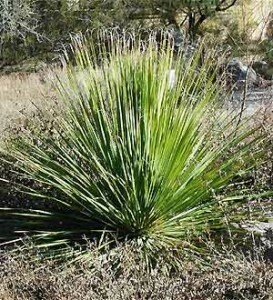 In regions that are totally frost free, it can grow up to 10 feet tall. 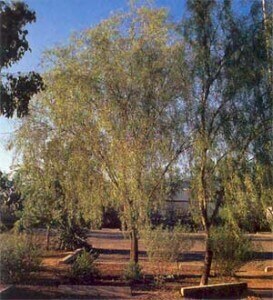 Its medium green, compound leaves contain up to nine sections, each of which has up to twelve pairs of small leaflets. Although it is cold hardy to 28º F, Red bird of paradise will shed its leaves at temperatures below freezing. In the spring, red racemes (flower stalks) grow up to 20 inches long. The racemes grow in a triangular, pyramid-like shape on which individual flowers bloom from March to October. The flowers are a brilliant mix of orange to red colored clusters with long stamens. Some varieties have yellow or orange tips on the flower petals or pure yellow flowers. Red bird of paradise makes an excellent accent shrub that is incredibly heat tolerant. Red Bird of Paradise grows best in full sun locations and in soil that drains well. It does not do well in heavy clay soils. Regular irrigations will help this plant maintain its vigor. Water established Red Bird of Paradise every week in the summer, every other week in the spring and fall, and at least once a month in winter. Apply a slow-release organic fertilizer annually in the spring. Toward the end of July, the first flush of bloom begins to fade. August is a good month to cut back dead flower stalks to the first set of new shoots that can be seen. This “heading back” will encourage another round of flowering that may last into October. Prune this shrub in the winter to shape and to control size. 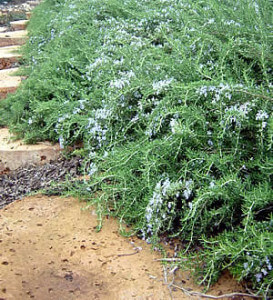 Every two years, it can be cut back to within a foot or two of the ground to reinvigorate the plant. The Red Bird of Paradise has astounding powers of recovery. Even those that freeze and die back to the ground will often return quickly and bloom the following summer.